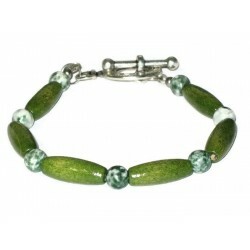 This men's bracelet consists of magnesite beads and wood beads. The bracelet is 8-1/4 inches w.. This 8-1/2 inch men's bracelet will be a cool addition to your collection of accessories to compli.. This stylish 7-1/4 inch bracelet has an assortment of wood beads and fastens with an eye-catching si..